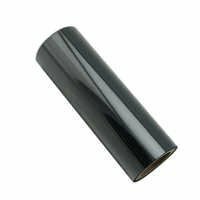 Thermals Barcode Ribbon, available here, is the ideal solution for shipping centers, offices, retail stores, and other corporate fields to sure complete ease and perfection in operations. It is designed from the finest grade materials to make sure exceptional quality with the Barcode printing process. This is perfect to be used in a wide variety of label materials with its exceptionally sensitive as well as quality print. This is an exceptional ribbon with its superb resistance towards smear and solvents at high temperature. It is widely used in thermal transfer printers for transferring the image to the transfer label by applying the heat from the print head. This high versatility product enables you to meet your varied requirements in different applications. It ensures an excellent printing quality on all kinds of text from very small to large characters, and logos. Its structure allows printing on a variety of label stocks like uncoated papers, synthetics, coated papers, etc.